In medium sized saucepan combine water, 3 tbsp sugar, salt and 2 tbsp vegetable oil. Stir well over medium heat until mixture just begins to boil. Remove from heat; stir in flour until ball forms. Heat oil in deep fryer or large skillet to 375°F. Using pastry bag or plastic storage bag with hole cut in one corner, pipe strips of dough into hot oil. Fry until golden; drain on paper towels. Combine sugar and cinnamon in large plastic or brown paper bag. 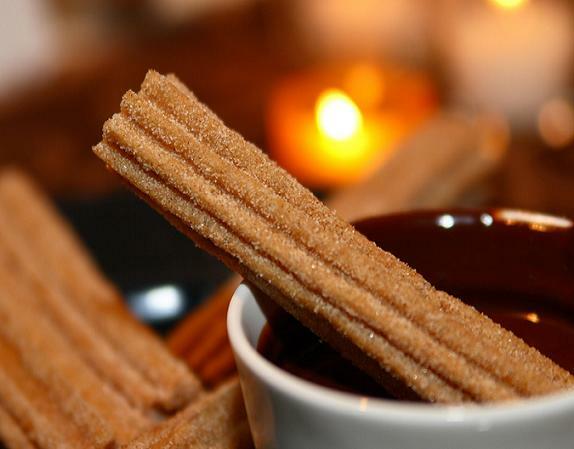 Drop churros into bag; seal tightly; gently shake until coated. Serve with hot chocolate or caramel sauce if desired.